First, allow me to explain what a Hobo is… The Hobo and Tramp clowns are the only two American clowns. All others come the European clowns. They both come from the great depression era. A Hobo clown is a happy clown… One who travels abroad just because he can. He has turned his back on society and chooses to live off of the land and ride the trains for the favorite mode of transportation. He will work when he needs money to buy things or perhaps to buy a warm meal and sleep in a nice warm bed every now and then. He tries to keep his clothes from being torn and tattered. He always carries little magic tricks with him to entertain the kids and folks wherever he goes. When you look at his make-up... the white around his eyes and mouth comes from when they ride the train, the soot blackened their faces, so to see they wiped their eyes and to eat their mouth. I have always loved the clowns. In December 2009, I attended the Egypt Shriners Hospital Patient Christmas Party and was able to play with several of our patients. It literally touched my soul. I knew then this is where I needed to be. I petitioned the clowns and joined. 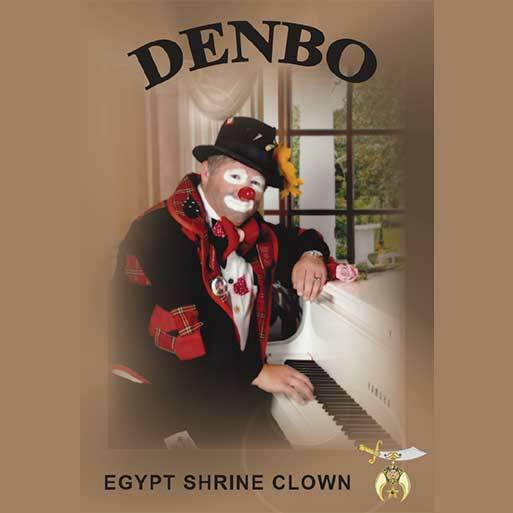 I took the name “Denbo” because, when I was a little boy growing up, my Aunt Faye always called me Denbo Dally. My Aunt Faye passed several years back… It was just a way to pay a tribute to her. During my tenure as a clown, I have attained the rank of Mater Clown by earning points for education and competition, I have attended Mooseburger Camp School in Buffalo, Minnesota. I have traveled to Plymouth Massachusetts many time to attend the Northeast Clown Institute. I was named Rookie of the Year and Clown of the Year, twice, by Florida Shrine Clown Association (FSCA). I was named Clown of the Year by our own Fun-N-Frolic Unit in 2012. I have served as Vice president and President of FSCA and the Fun-N-Frolic Unit. Currently I am serving as the Chief Rabban for Egypt Shriners and I am really looking forward to returning to the unit after my time is up on the Divan. My favorite say is: "Everyone is a clown... But, only a few of us have the courage to put on the makeup!"